This peak is #22 on the Height List for Oregon . 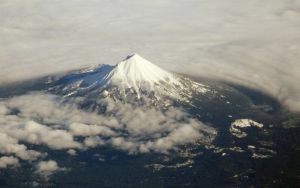 This peak is #5 in Prominence List for Oregon .Mount McLoughlin is an extinct volcano in southern Oregon. A trail leads to the summit from the southeast. Name Notes: Named for the HBC boss at Fort Vancouver, John McLoughlin who, despite his British subject status and employment, favoured the annexation of the Oregon Territory to the United States and generally acted in favour of this eventuality. He is considered the "founding father of Oregon" and resided in his later years in that new state's Williamette Valley.